Installing the EVE eStore package into your dive operation provides you with a single solution for the management and marketing of all your customer activities, across every area of your in-store and online EVE eStore. EVE is designed to work with you, actively recording, monitoring, measuring, integrating and communicating with all other EVE systems you have installed to manage your customer service and business activity. As an example of the synergy of EVE eStore package integration: when you create a new course or a trip on EVE in your store the corresponding pages on your EVE OnLine store will display the new changes to the calendar schedule instantly. Your customers will be contacted via the EVE Agent informing them of the new activity. Customers can view the activity, book and pay seamlessly via your EVE OnLine store which will record the sale and add customers to their chosen courses or trips in EVE, All of this happens in real time. That’s not all… now your customers are booked, EVE Agent will further contact your customers before, during and after their chosen activities. Just an example of the integration of EVE systems working together to enhance your service and sales. All EVE systems communicate with each other in real time. 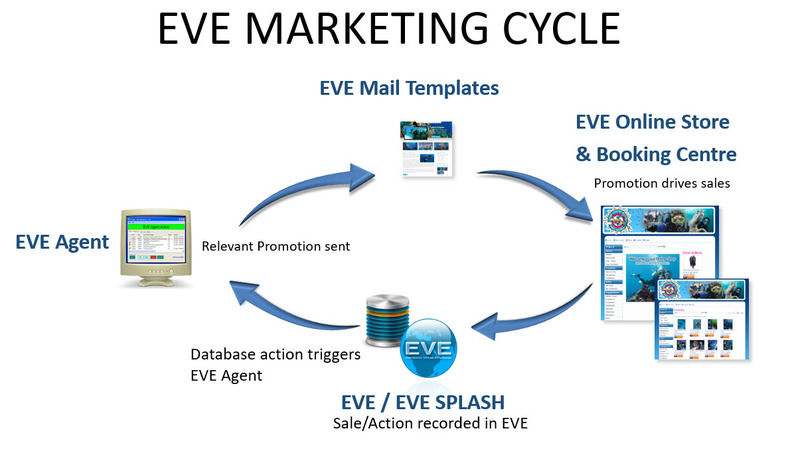 The seamless integration across EVE’s applications allows you to easily monitor customer activity and transmit highly effective marketing media through our proven designed marketing cycles. EVE has over one hundred custom designed mail templates which are proven to increase customer activity, enrolment and purchases. Control your dive business, using EVE’s powerful in-built technologies, allied with the benefit of having a single point of reference. The primary focus of EVE's design, is to make the management of your business easier by standardizing staff and logistical practices across your entire operation. This powerful system will not only increases your gross sales but allow you and your staff more available time to focus on taking care of your diving customers needs. After all, is it not your job to make their dreams come true? Happy customers spend more time diving with you, which in turn increases your bottom line. Services - Work Orders/Part Tracking and Ordering. Inventory – Manage What you Sell and When - Both Instore and Online. Daily backups, available for download. Sell gear, courses and trips online. . All Sales Managed and Recorded, Synchronized Real Time within EVE. 3 webinars to learn tricks&tips on how to use EVE Enterprise to increase sales and certifications. Whether you are just starting out with EVE, simply just interested, or already an existing EVE customer, running with some EVE applications, employing the synergy of the EVE eStore package will provide you with a powerful, cost effective solution for your physical and online store needs. Whether you wish to get going as a first time user, or are interested upgrading your existing system, please contact our dedicated team, we will arrange a personal online demonstration of the Award Winning features of EVE.